As was stated earlier, Rear Admiral Turner remained at Kwajalein Atoll until the capture of Eniwetok Atoll had been completed and the garrison forces were readying to take over. He departed in his flagship, Rocky Mount, for Pearl Harbor on 25 February 1944, entering that port on 3 March 1944. During the long, long month commencing on 5 February, he had been sitting on the anxious seat waiting for his promotion to Vice Admiral to be approved by the United States Senate, and more than a bit disturbed by the backstairs gossip surrounding the delay. The hard-fought assaults on Kwajalein and Roi-Namur, and then on Engebi, Eniwetok and Parry, combined with this backlash had worn him down to a nubbin. Kelly was operating under a forced draft. There were times during this period when I wanted to reach out and shake Kelly. But Spruance always said: 'Let me handle him' and handle him he did. I always attended rehearsals that were held in the Hawaiian Islands. Kelly had a firm hold on rehearsals and did a magnificent job. His insistence on rehearsals was a major factor in his success. ever increasing number of old shipmates were aware that Kelly Turner was partaking more freely of the liquid that cheers, but all reports indicated that he was handling it extremely well. To defeat the Japanese, we had long recognized that we must plan ultimately either to invade the home islands or else destroy their armies in Manchuria and North China, and then isolate the home islands by blockade. We also needed to weaken their industry by strategic air bombing in order to reduce their logistics potential at home. Thus it was necessary for us to concentrate large military forces, land, sea, and air, plus heavy stocks of material in bases reasonably close to Japan. In turn, that meant that we required large land deployment areas and large harbors in the Western Pacific Ocean. . . .
Out of the SEXTANT American-British Conference ending at Cairo, Egypt, on 6 December 1943, came the necessary approved plan to conduct the war against Japan throughout 1944. The Combined Chiefs of Staff and our own Chiefs of Staff never lacked for suggestions or recommendations from the Pacific or the Southwest Pacific commands as to how the war against Japan might be won. And frequently they received contrary recommendations from Admiral Nimitz and General MacArthur. In December 1943, the scales were tipped very lightly in favor of doing what Admiral Nimitz recommended. Based on these high level decisions, Admiral Nimitz promulgated his GRANITE Plan. This covered the prospective operations against the Japanese in the Central Pacific Ocean Area during 1944. Admiral King also believed that reaching the mainland of China was a major objective of the drive through the center of the Pacific Ocean. This was in order to take advantage strategically, not only of China's geographical position but of her huge manpower. Two things happened in the first seven weeks of 1944 to change the strategic picture further in our favor. The Japanese Combined Fleet retreated from Truk Atoll to the Palau Islands in the Western Carolines. Eniwetok was taken in late February, rather than in early May. Admiral Nimitz believed that following the latter schedule, which advanced the assault date on the Marianas by two and a half months, would permit readiness of his forces in the Pacific Ocean Areas to launch a major assault in the Formosa-Luzon-China area in the spring of 1945. While awaiting the decision by Admiral King and the Joint Chiefs of Staff, Admiral Nimitz's Staff would not be idle. The Admiral wrote Admiral King that: "Plans are being drawn up and forces prepared for either objective [Truk or the Southern Marianas]." It should be recorded here that there was some naval opposition and considerable lack of enthusiasm for the operation to take the Southern Marianas. This arose because of the complete inadequacy of the harbors in Saipan and Tinian and the limited capacity of Apra Harbor, Guam. For a satisfactory mobile logistic support base in this general area it would be necessary for the Pacific Fleet to go 400 miles southwest of Guam to Ulithi Atoll in the Western Caroline Islands. Eniwetok had a fine anchorage, but the rim islands were all too small for the development of shore-based storage and work shop activities. Moreover, it was located a thousand miles back towards Pearl Harbor from the Marianas. Admiral Nimitz's letters to COMINCH and later visits to Washington were occurring against a background of strong urging by General MacArthur during January and February 1944, to do something quite different with the naval forces of the Central Pacific. 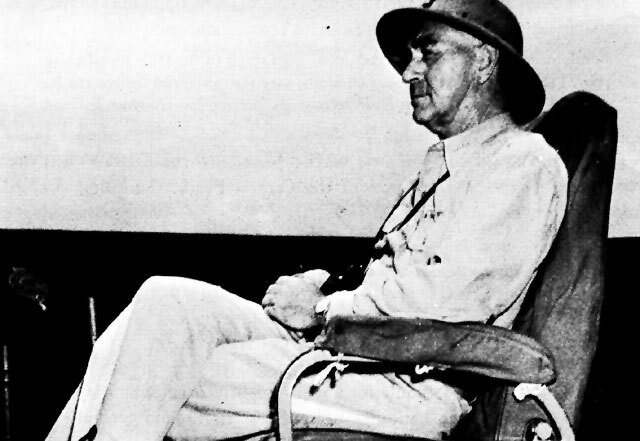 Despite the firm decision of the Combined Chiefs and the Joint Chiefs of December 1943, that the Central Pacific campaign would have priority, General MacArthur sought to advance his own proposals by sending his Chief of Staff and supporting officers to Pearl Harbor, and then on to Washington. This tied in with the Central Pacific Campaign far more realistically than the south-north drive up through New Guinea, particularly when coupled with a Joint Chiefs' cancellation of General MacArthur's proposed assault on Kavieng in New Ireland, and advice to him that the Central Pacific Campaign had priority in military resources over the Southwest Pacific Campaign. 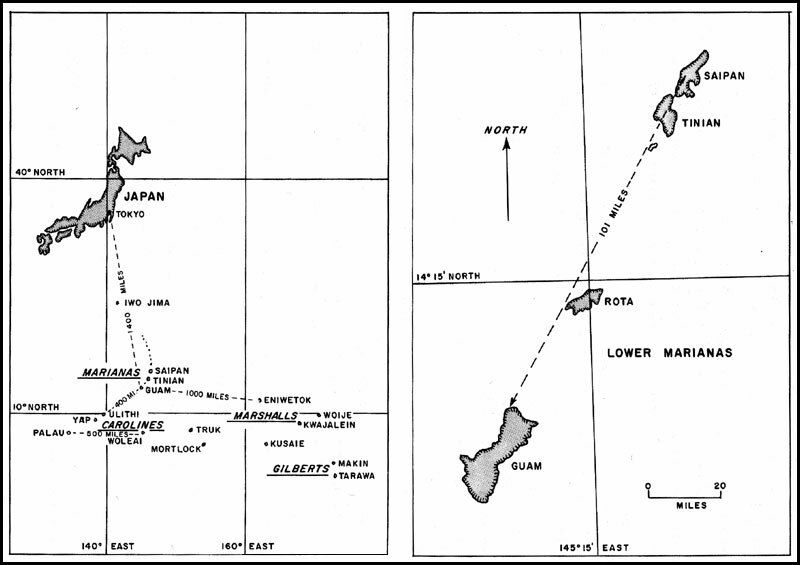 Pacific and Lower Marianas distance charts. on 15 November by General MacArthur, supported by the Pacific Fleet, and Luzon or Formosa would be assaulted on 15 February 1945. The object of taking Mindanao was to further the advance to Formosa either directly or via Luzon. The JCS directed that long-range planning be undertaken for assaults on all three objectives--Luzon, Formosa, and the China coast area--with General MacArthur's Staff undertaking the first, and Admiral Nimitz's staff the latter two. The code name of FORAGER was assigned to the capture, occupation, and defense of Saipan, Tinian, and Guam. The Commander in Chief, Pacific had four principal purposes in mind in launching FORAGER. The obtaining of an island base from which the Japanese homeland could be bombed was the one appealing to all Services, although more strongly to the Army Air Force, since it would permit them to really pull an oar in the Pacific War. A second principal purpose was to obtain a base which would permit the isolation and neutralization of the Central and Western Carolines. This one appealed particularly to the Army as it was anxious to facilitate General MacArthur's movement to the Philippines, and this would be made more practical if, as he advanced, Japanese island positions on his right flank were isolated or neutralized. The other two principal purposes were primarily naval. The Navy thought it was highly desirable to have effective command of the sea in the general Marianas area, and thus a forward position on the flank of the Japanese communication lines to the Philippines and Southeast Asia. This was in order to harass or break these Japanese lines of communication. There also was a strong naval desire to secure a large base from which a direct amphibious assault could be launched against the Ryukyus, the Bonins, or the Japanese Homeland. captured in 1943 and early 1944. Rather than small flat rims of coral, they were good sized islands with all the defensive possibilities which real fortification, rough terrain and tropical growth over large land masses can provide. Secure lines of communication to the zone of conflict. Command of the seas around the objective. Command of the air around the objective. It has to be kept in mind that an invader is most vulnerable as he hits the beaches. This is the transition period of an amphibious assault. Three divisions, which had been earmarked for the sequential assaults on the Mortlock Islands and on Truk, were designated for the invasion of Saipan and the subsequent capture of Tinian. These were the Second and Fourth Marine Divisions, with the 27th Infantry, a National Guard unit from the State of New York, in reserve. They were to be mounted in the Hawaiian Islands, 3,000 miles away. For the assault on Guam, the Third Marine Division and the 1st Provisional Marine Brigade, made up of the 4th Marine Regiment, the 22nd Marine Regiment, and, after 10 July 1944, the 305th Infantry Regiment, were assigned. The units initially assigned were designated the 3rd Amphibious Corps on 15 April 1944, Major General Roy S. Geiger, USMC, Commander. They were to be mounted in Guadalcanal and the New Hebrides, 1,650 to 2, 200 miles southeast of Guam. The 77th Infantry Division, training in the United States during the early planning period, was to be brought to the Hawaiian Islands by March, and alerted for a move on to the Marianas twenty days after Dog Day at Saipan. It could not be mounted for a Dog Day assault or as the Guam Reserve because of lack of transports and cargo ships.13 From this listing of participating troops, it is apparent that the Marianas was to be the biggest amphibious assault to date in the Central Pacific Campaign with three and two-thirds divisions designated for assault and two divisions designated for the Reserve. Before the operational phases of the Marianas campaign are related, a few of the major changes in the administrative and organizational aspects of the Amphibious Forces, Pacific will be set down. COMINCH, on 1 February 1944, assigned all attack transports, attack cargo ships, and landing ships and craft, in or destined to report to the Pacific Ocean Areas, to Commander Amphibious Forces, Pacific (Rear Admiral R.K. Turner). This broadened his command from the Fifth Amphibious Force in the Central Pacific to all the amphibious forces in the Pacific Ocean Area.15 On 8 March 1944, Vice Admiral Turner reported to CINCPAC for this additional duty which included command of all amphibious craft assigned to the First, Third, Fifth, and Ninth Fleets; the Amphibious Training Command; and the Army, Navy, and Marine Corps units currently assigned to those Amphibious Forces for training or combat operations. He was also responsible for the preparation and periodic correction of two Pacific Fleet publications entitled Tactical Orders, Amphibious Forces, Pacific Fleet and Current Doctrine for Amphibious Forces, Pacific Fleet. appropriate division commanders, group commanders and flotilla commanders. The need was brought to the attention of CINCPAC and COMINCH, and the latter, on 30 March 1944, authorized remedial action. Thereafter, COMPHIBSPAC, acting under delegated authority, reorganized the LSTs, the LCIs and the LCT' s, generally on the basis of geographical location. This, as many skippers were quick to report, broke up many fine chains of command which had existed since the landing ships and craft were on the building ways back in the States. Soon afterwards, a more favorably-received step was taken. This was to provide adequate repair facilities for these craft even in the forward areas. By the time the Fifth Amphibious Force was deep in its training to take the Marianas Islands, Vice Admiral Turner's Staff had grown to thirty officers. The number of officers attached to the staff for communications, intelligence and other specialty duties had increased to 56. The Chief of Staff had been advanced in rank to Commodore early in April 1944. The Marianas are a 450-mile long string of fifteen volcanic islands lying north and south between Latitudes 13° and 21° north, and generally along the 145th parallel of east longitude. Guam is the southernmost of the island string. It lies a bit less than 1,400 sea miles south-southeast of Tokyo and 1,500 sea miles east of Manila. 101 miles separate Saipan, the second largest of the Marianas, from Guam. Tinian nestles up to Saipan and Rota is 37 miles northeast of Guam. Eleven smaller islands stretch 350 miles north of Saipan. Guam also is the largest of the Marianas, with a land area of 206 square miles. Saipan covers 70 square miles and Tinian only 38 square miles. Each of these three islands has both rock-ribbed hills and swampy valleys. Guam has half a dozen rugged peaks over a thousand feet high with the highest being Mount Lamlam of 1,334 feet. Saipan tops out in its center at Mount Tapotchau at 1,554 feet, while smaller Tinian, in general, is flatter with Lasso Hill of 564 feet its highest point. Tropical vegetation, in 1944, covered much of the islands, and there were marshes and rice paddies in the lowlands. The only useful harbors in the group are Apra Harbor in Guam and at Tanapag in Saipan. The latter is very small. The tide in the Marianas is negligible since it is less than 1.5 feet. Raising sugar cane, copra, bananas, and papayas were the principal activities of the natives in 1944. Seventy percent of Saipan was under sugar cultivation. trade winds and the Japanese, reputedly, had not used the bay because of this and the inshore reefs. 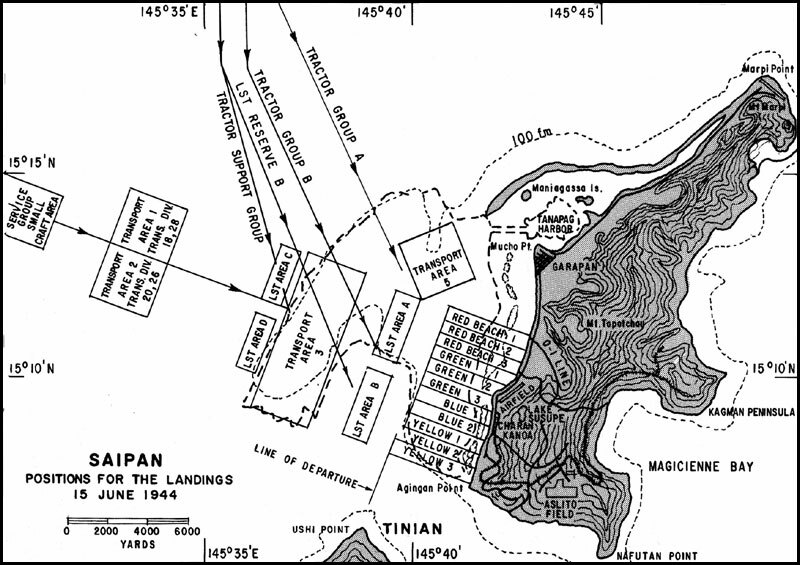 Tinian had the same natural defenses as Saipan's east coast--healthy sized cliffs and very narrow shallow beaches. This would make the logistic support problem very difficult in the early hours of any assault landing. whole east coast of Guam was marked by a 400-foot plateau and a narrow coastal flat. However, in the vicinity of Agana Bay near the capital Agana, there were some breaks in the long reefs on the western side of the island, and another break south of Orote Peninsula. This peninsula jutted out three miles into the western ocean and provided a lee for the beaches south of it. In a few words, the weather was warm, showery and generally overcast. The summer months are the rainy season, August being the wettest month with numerous thunderstorms and squalls. Typhoons are scarce around the Marianas but do occur. The monsoon winds blow in from the southwest in August and September; the trade winds blow from the northeast the rest of the year. handle 600 aircraft.25 In the Southern Marianas, by early June 1944, there were two Japanese airfields operational on both Saipan and on Guam, three operational airfields on Tinian and a surfaced runway on Rota. Additional airfields were in various stages of completion. There was a major Japanese seaplane base at Tanapag Harbor on Saipan. This was done by Navy PBYs, flying out of Eniwetok on 18 April and 25 April 1944, and again on 7 May and 29 May 1944. The submarines of the Pacific Fleet during April 1944 gave their particular attention to prospective landing beaches with rewarding results. The natural defenses of Saipan, the first island in the Marianas to be assaulted, were considerable. The east coast was largely free of fringing reefs except around the largest bay--Magicienne Bay--but the beaches were narrow--and more importantly from the Marines' point of view--the shores back of the beaches were steep, rugged and easily defended. The west coast of Saipan was lower and the land back of the beaches sloped gently upward, which was fine from the Marine point of view. But, with the exception of a gap off Charan Koa and the entrance to Tanapag Harbor, a barrier reef protected the whole west coast of Saipan. On Saipan the Japanese had an island 123/4 miles long and 53/4 miles wide to defend. 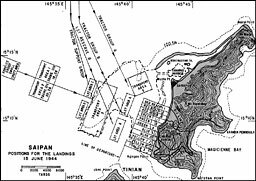 In comparison, the later objectives, Tinian was 10.5 miles long and markedly narrower than Saipan, while Guam was 32 miles long and 4 to 8 miles wide. defenses and their defensive forces in the Marianas, but, additionally, reorganized the command structure which controlled the area. The Fourth Fleet which had held the bag during the loss of the Gilbert Islands and the Marshall Islands was downgraded to controlling only the naval garrisons in the Eastern Carolines (including Truk) and the bypassed garrisons in the Marshalls, all of which were dying on the vine. A new command directly under the Combined Fleet, called the Central Pacific Area Fleet, was established under the command of Vice Admiral Chuichi Nagumo, IJN, who had been commander of the Japanese naval force making the surprise attack on Pearl Harbor. Vice Admiral Nagumo maintained his Headquarters on Saipan and was present and accounted for when the assault commenced. He controlled the naval garrisons in the Western Carolines where the important Palau Islands were located, as well as the Marianas and the Bonins where Iwo Jima was located. The responsibility for the defense of individual islands rested upon the senior Army or Naval officer assigned to that island. By and large, the Japanese Army was able to place the senior officer on each island. Saipan also housed the Japanese Army command for all Japanese Army forces in the Mandates. This was the 31st Army. Its Commanding General was Lieutenant General Hideyoshi Obata. He lived a few days longer than others because he was absent from his command and in the Palau Islands for a conference when we landed 01115 June 1944. His senior subordinate, Lieutenant General Yoshitsugu Saito, IJA, Commanding the 43rd Division, took over Obata's duties and fought the good fight. Eighty percent of the Japanese troops of this particular movement were saved but their heavy equipment including guns and ammunition were all lost. Subsequent to the capture of Saipan, an inspection of its defenses was made by the Engineering Section of the Expeditionary Troops. Information was obtained from an important prisoner of war who had been the former Intelligence Officer of the Japanese 43rd Division and from captured documents. . . . The prepared defenses of Saipan were amazingly inadequate and incomplete. . . . Not a single battery position or fortification inspected was entirely complete. . . . In the Garapan Naval Depot, the following guns were found: 3 5" coast defense guns, 1 140-mm coast defense gun, 32 120-mm dual purpose guns, 6 200-mm mortars. When Task Force 58 raided the Palau Islands at the end of March 1944, the Japanese Combined Fleet once again retreated westward, this time to Tawi Tawi Harbor in the Sulu Archipelago in the Southwest Philippines. It was operating in this area, 1,600 miles away from the Marianas, when the Joint Expeditionary Force moved in to assault the Marianas. Worried about the defense of western New Guinea, a good sized detachment of the Combined Fleet was under orders early in June 1944 to support a Japanese amphibious assault to recapture Biak Island off northwestern New Guinea. Japanese land-based planes from the Marianas were ordered down south to Halmahera to support the operation. The Japanese task force for this assault, Operation KON, was actually well assembled at Batjan in the Moluccas (southwest of Halmahera, four hundred miles south of Mindanao) by 11 June. Reports of the TF 58 raids on the Marianas late on that day raised doubts in the minds of the Japanese as to whether the Marianas were being raided or whether they were a United States amphibious assault objective. Upon receipt of news on 13 June that battleships were bombarding Saipan, the Japanese assault on Biak was cancelled by Admiral Toyoda, Commander in Chief Combined Fleet. He had succeeded to command the Combined Fleet upon the death in a plane accident of Admiral Koga.31 The cancellation was the first of many pleasant dividends from FORAGER. To give further orientation on the titular nomenclature used in the Central Pacific it should be recorded that when Admiral Spruance was directed to conduct the wide-ranging FORAGER Operation it was as Commander Fifth Fleet rather than as Commander, Central Pacific Task Forces. Vice Admiral Turner organized the Joint Expeditionary Force, TF 51 as shown on page 875. The Expeditionary Troops included the two Landing Forces, each approximately the equivalent of a corps command, as well as the Expeditionary Troop Reserve and the Garrison Troops. Lieutenant General Smith retained command of the Northern Landing Force, but in this task used a staff separate from the one which functioned with him in the whole Expeditionary Troop command. Major General Roy S. Geiger, USMC, commanded the Southern Landing Force at Guam. The two assault Landing Forces initially totaled 127,500 men, with 71,000 for Saipan and 56,500 for Guam. Infantry Division, initially designated "In general area reserve" but planned to be used for the Guam landings. As it turned out, the "general reserve" was embarked from Pearl Harbor in two echelons based on the availability of transports. Captain J. B. Heffernan (1917) embarked the first echelon, the 305 Regimental Combat Team from the 77th Division, in a division of transports on 2 July, and Captain H. B. Knowles (1917) embarked the second echelon, which was the remainder of the 77th Division in two divisions of transports on 9 July. would complete its missions for FORAGER about Dog Day plus 40 (July 25th) and that the entire movement of garrison forces and equipment would be completed about Dog Day plus 80 (September 3rd).33 The first estimate turned out to have been optimistic. In the Saipan landings, Vice Admiral Turner took one more step away from the immediate control of all the details of the assault landing operations. At Kwajalein the actual landing of the Landing Force with its ten times a thousand details had been turned over to the Commander Transports. At Saipan there was an even greater divesture of detailed duty, with Rear Admiral Hill, the Second-in-Command, taking over a very large share of the duties of the Attack Force Commander. No sale of this suggestion was made. Vice Admiral Turner issued his Attack Order A11-44 for the Northern Attack Force on 21 May 1944. Its size and complexity tended to dwarf previous assault orders. It ran to 341 pages, which added to the 41 pages of CINCPAC's order, the 163 pages of Commander Fifth Fleet's order, and the 254 pages of Commander Joint Expeditionary Force's order, provided 800 pages of reading matter plus dozens of chart diagrams for the amphibians to peruse. an effort to avoid a recurrence of the boat control problems which had plagued the Northern Attack Force at Roi-Namur. A Demonstration Group of nine transports and four cargo ships was organized from ships carrying the Division Reserves. A good many of the amphibians who had carried through in the Marshalls were available, and a few amphibians, such as Captain Herbert B. Knowles, Captain Donald W. Loomis and Captain Henry C. Flanagan, dated back to the Gilberts, or New Georgia and even to Guadalcanal. However, the Bureau of Naval Personnel was sweeping most of the veterans ashore, and one had to fight the Bureau real long and hard to stay at sea and fight the war. The Northern Attack Force was organized in Attack Order A11-44 of 21 May 1944 as shown on page 877. Note (1) * LST destroyed by fire and explosions in fire at Pearl on 21 May 1944. *** Did not actually participate in amphibious assault. Note (2) Commanding Officers as of 1 July 1944, except for LSTs destroyed which are as of 21 May 1944. There were changes in command during the campaign. Note (3) Names of Officers in Charge of LCTs have not been located. The Scheme of Maneuver for FORAGER called for landing first on Saipan on 15 June 1944 with two divisions of troops, the Second and Fourth Marines. They were to land abreast over the western reef on beaches adjacent to the sugar refinery village of Charan Kanoa and on both sides of Afetna Point. They were to strike across the island, expanding the attack to the south, and overrun Aslito airfield in the southern part of the island. A major innovation was that early on 15 June the transports carrying the Division Reserve were to make a feint of landing troops at beaches north of Tanapag Harbor, and about four miles to the north of the actual landing beaches at Charan Kanoa, in the hope of deceiving the Japanese regarding the primary point of attack and thus to immobilize temporarily their reserves believed to be in the area around Tanapag Harbor. The transports of the Demonstration Group were ordered to lower their landing craft from the davit heads, to simulate debarkation of troops and to make smoke and maneuver as necessary. The transports were to remain outside of the effective range of enemy shore batteries but the largely empty landing craft were to make a run into within 6,000 yards of the beach. After the capture of Saipan had been completed, the troops who had accomplished this task were to be reorganized and then capture Tinian. The landing places on Tinian and the exact units to conduct the assault were to be determined later, but it was hoped to land about 5 July 1944. The landing on Guam tentatively, and hopefully, set for 18 June, was to be accomplished by two simultaneous assault landings. 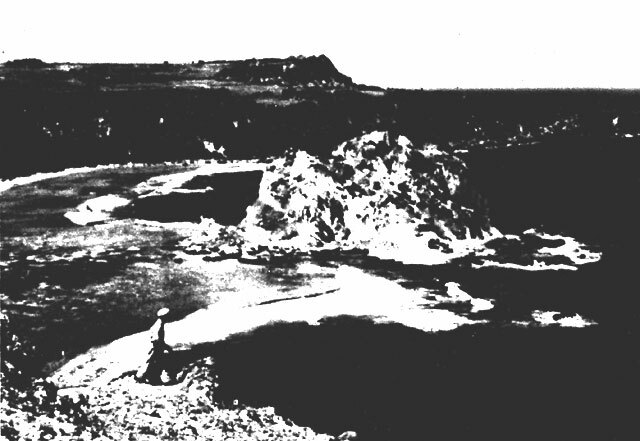 The Third Marine Division was to land over the reef at Asan Village west of Agana. The 1st Provisional Marine Brigade was to land over the reef in Agat Bay south of Orote Peninsula. The Marines were to hold on the left and expand to the front and right. The 1st Provisional Marines were to hold on the right and expand to the left, capture Orote Peninsula and then join up with the Third Marines. After the Third Marines and the 1st Provisional Brigade had joined forces, the Scheme of Maneuver called for holding on the south and moving east across Guam to cut the Japanese defense forces in two. Fortifications, radar, and air facilities on Saipan. for the assault landing, called for one regiment of the 77th Infantry to be the Brigade Reserve, and the other two regiments to be the Corps Reserve, and for both to prepare for landings at Agat. 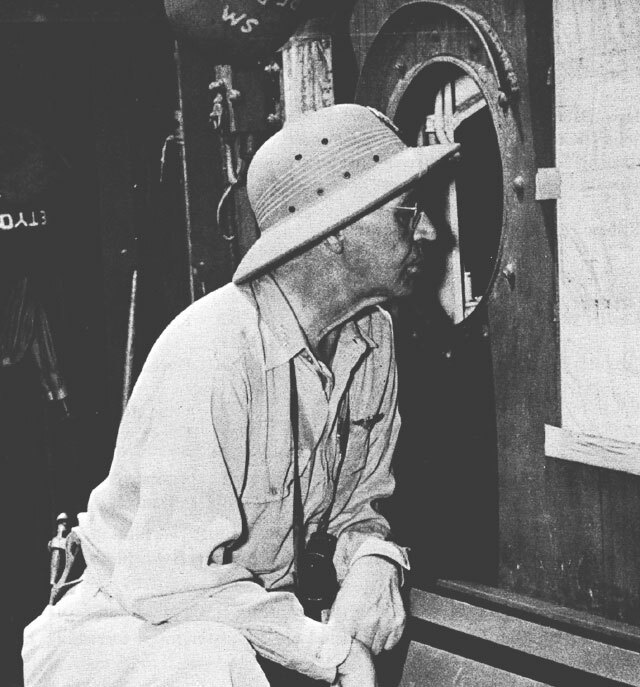 Commodore L.F. Reifsnider, who had fought through the Guadalcanal and New Georgia campaigns, was designated the Second-in-Command to Rear Admiral Conolly (CTF-53), who had the assault chore at Guam. Well before the landing operation was underway, the Commodore received his promotion to Rear Admiral. 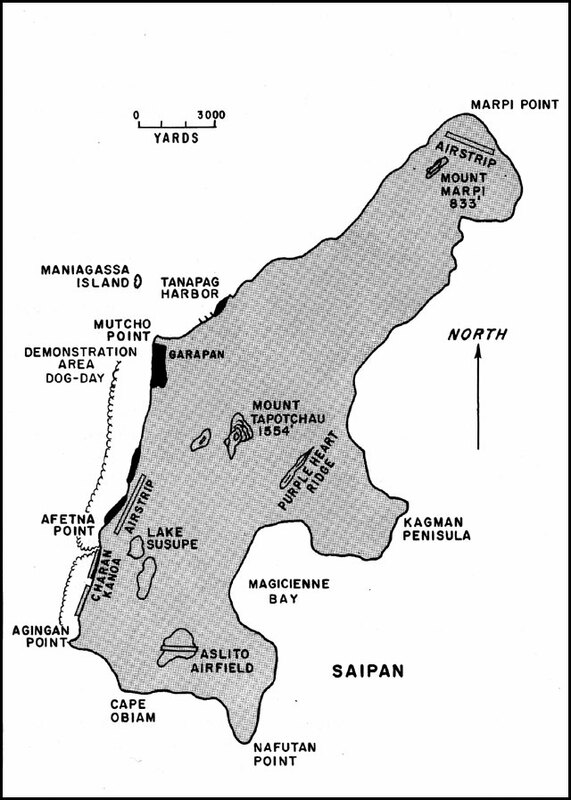 Alternate plans were drawn up by the Northern Attack Force for landing at Tanapag Harbor, Saipan, in case surf or other conditions were not suitable for landing at Charan-Kanoa. Arrangements were also made to transfer the troops making up the early assault waves at Saipan to LSTs at Eniwetok, so that these troops would not have to undergo a time consuming transfer period off the landing beaches, and they would not have to exist in vastly overcrowded LSTs for more than four or five days. Similar arrangements using further away Kwajalein as a staging point were made for assault forces against Guam. The gunfire support ships and the jeep support carriers were divided about equally between the two attack forces, with the Guam contingent directed to assist in the Saipan attack with limited ammunition and bomb expenditures. The Saipan gun and air support contingents were due to repay the favor later, having been resupplied by mobile logistic support forces in the meantime. 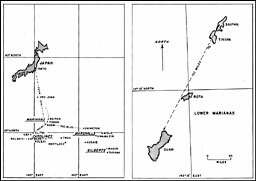 The Southern Attack Force was to arrive about 80 miles east of Guam at 1700 June 16th, so as to be able to initiate minesweeping, underwater demolition, and last minute photo reconnaissance should it be practicable to carry out the June 18th assault. was the biggest and longest held to date in the Pacific campaigns. Several mishaps during the rehearsal and post-rehearsal period left their mark on the amphibious forces. On the suggestion of Rear Admiral Harry W. Hill, each of three LCTs was equipped as a gunboat with six 4.2-inch Coast Guard mortars and 2, 500 rounds of projectiles. These were desired primarily to protect the left flank of our Landing Force against Japanese reserves moving down the coastal road from Garapan. By having the LCTs steam parallel to the beaches, they would also be able to cover the landing beaches with a blanket of heavy mortar fire while the assault waves were being formed. In other words, the rehearsal served its essential purpose. For the FORAGER Operation, 47 LSTs were assigned to the Northern Attack Force by Commander Joint Expeditionary Force. After they had participated in the big rehearsal held between 14 and 20 May, they returned to the Pearl Harbor Naval Base and were nested in West Loch near the Naval Ammunition Depot for final preparations before sailing on the campaign. Pacific Ocean Area. Because of this lack, 16 LSTs had been designated to each carry 750 rounds of 5-inch 38-caliber anti-aircraft shells and the powder for them. Ten more LSTs were designated each to carry 270 4.5-inch rockets, 6,000 rounds of 40-millimeter and 15,000 rounds of 20-millimeter machine gun ammunition. So the nested LSTs were tinder box inflammable, since gasoline in drums covered much of their topsides, not already occupied by vehicles, and they had much ammunition stowed outside of their magazines. Because of the loss of the two of the "LCT gunboats," Vice Admiral Turner made the decision to abandon this project. A natural corollary of that decision was to unload the 4.2 mortar ammunition out of the remaining "LCT gunboat." The unloading detail was disaster-bound. One or more 4.2-inch high explosive mortar shells being off-loaded by Army personnel into an Army truck on the elevator on the forecastle of the LST-353 exploded about 1508 on 21 May 1944. Those who saw the explosion from close aboard died. The immediate follow-up explosion was severe enough to cause a rain of fragments on all eight LSTs in the LST nest, and to start serious gasoline fires on three of these LSTs. A second large explosion at 1511 in the forward part of one of these three LSTs rained burning fragments on nearly all LSTs berthed not only in the nest but in the West Loch area. This led to a further large explosion at 1522 and the rapid burning, wrecking and loss of six LSTs and the three LCTs carried aboard three of the LSTs. In a general article about Admiral Turner, his participation in fighting the inferno of burning and exploding LSTs is described in a bit more detail by Robert Johnson in the Honolulu Sunday Advertiser for 13 September 1959. He was rough and tough in West Loch the afternoon and evening of May 21, 1944, in the glare of explosions that might have caused a serious delay in his plans for the capture of Saipan in June. I received an order from an Admiral to proceed to T9 (an ammunition depot dock) and put out the fire there. Due to the fact that ammunition was exploding, I backed away. The Admiral came to me and said: 'Go back in there and stay or I will shoot you.' Four or five LSTs were at T9, all of which were burning and terrible explosions were occurring but I carried out my last order, as I had been told. Even worse than the loss of the ships and craft was the loss of 163 men and the injury of 396 others. Since the LSTs were scheduled to sail on 24 May, it took a bit of doing to put the various LST task units and troops back together with all the necessary amtracs and DUKWs and replacement personnel. Departure of the LSTs took place on 25 May, and the sturdy craft made up the lost day while enroute to the assault area. The need for fleet ammunition in large quantities during the early stages of the war did not develop and never became a matter of large scale expenditure, with a corresponding quick replenishment on a gigantic scale, until after we started the Central Pacific drive. Late in April, 1944, Vice Admiral Turner recommended that the Amphibious Force, Third Fleet, be brought to the Central Pacific from the South Pacific, and that additional Amphibious Groups be established, so that the various landings being contemplated could be adequately prepared for. Enroute to the Marianas, word was received from COMINCH that a reorganization along these lines was ordered. Six Amphibious Groups were established in Amphibious Force, Pacific. This major increase in the number of amphibious groups showed an acceptance at the highest naval level of the ever increasing number of troops which would be involved in conquering the stepping stones to Japan. Since the Fourth Marine Division was on the island of Maui, the Second Marine Division on the island of Hawaii, and the 27th Infantry Division on Oahu, and the ports of Kahului on the north coast of Maui and Hilo on the east coast of Hawaii were small, the loading of the Northern Attack Force took inordinately long. The Southern Attack Force troops were loaded at the small man-made ports in Guadalcanal and the Russell Islands in the Southern Solomons. Altogether there were 21 separate movement groups in the Joint Expeditionary Force for the initial phases of the FORAGER Operation, and 33 altogether by 15 June 1944. All were operating on a rigidly controlled schedule. Some groups replenished at Kwajalein, some at Roi-Namur and others at Eniwetok. The Main Body of the Northern Attack Force took to sea on Decoration Day, 1944, but the lesser amphibians from the Hawaiian area eased out to sea almost daily during the long period from 25 May until 2 June. The Southern Attack Force from almost Down Under sailed between 3 and 6 June 1944. Except for a collision subsequent to an emergency turn at night between the destroyer transport Talbot and the Pennsylvania on 10 June, the bucking of an adverse current and the usual ration of possible sound contacts of submarines, passage of both Attack Forces to the objective area was uneventful. In single words, Japanese troop strength in the Marianas was "underestimated" by our Forces before the campaign, and has been " growing" since the campaign. On 31 August 1944, with the three island battles over and won, and the report stage reached, Commander Expeditionary Troops (Lieutenant General Smith) estimated that there had been 54,000 Japanese military personnel on the three islands when CTF 51 commenced the assault. This figure was sizably larger than the approximately 2,400 prisoners of war who had been taken and the 43,000 Japanese who had been reported buried. By and large those buried were Japanese military personnel, although not all were combat troops by any means. If, since World War II the Japanese have recorded their troop strength in the Marianas about 15 June 1944, I have missed it. During the Saipan battle, two Japanese prisoners of war, one a naval commander and executive officer of the naval station there, each estimated the combined strength of Japanese Army and Navy troops" on Saipan as about 20,000.49 This could be correct since there were considerable numbers of air base personnel and construction and maintenance personnel, including Koreans who might not, in the minds of the POWs, have been considered "troops." 20,000 troops were estimated to be on Saipan. Among captured documents are those indicating strength of enemy to be about 23,000. As a result of intensified "clean up" drive, 147 Japanese soldiers were killed on Saipan during the past 24 hours. An average of 50 per day have been killed on Saipan since that island was secured. When the FORAGER campaign was over and won and the victors were enroute back to Pearl Harbor, busily writing their reports, both CTF 51 (Vice Admiral Turner) and CTF 56 (Lieutenant General Smith) showed marked agreement in their estimates of Japanese military strength on Saipan. From the day of the assault to 15 August approximately 25,144 enemy dead had been buried and 1,810 prisoners captured. The unknown number of Japanese civilians who were killed while performing logistical tasks in Japanese troop rear areas as the Japanese Army retreated northward, and the considerable number of Japanese civilians who committed suicide in the final days of the battle, both markedly increased the figure of "enemy dead buried" over the actual number of Japanese "troops,"
The point of all this is that since the number of assaulting troops should be three to four times the number of defending troops, the failure of our intelligence to determine reasonably closely the very healthy number of Japanese defenders in the Marianas made the task of the Landing Force long, difficult and costly. Including the Floating Reserve, 71,000 troops were in our original assault force against Saipan. This was quite an adequate number to overrun quickly an island defended by only 17,600 then the estimated Japanese troop strength when TF 51 sailed from Hawaii. With 24,000 Japanese troops on Saipan, our assault forces, using the same ratio, should have numbered in the neighborhood of 100,000. As one commentator wrote on 23 June 1944, in a "Daily Running Estimate" prepared for COMINCH by his staff. The delay in conquering Saipan, basically caused by an inadequate number of assault troops and faulty intelligence upset a lot of people, including Vice Admiral Turner. During the last part of the period when Vice Admiral Turner and his Expeditionary Force were wending their way from Guadalcanal and from Pearl towards the Marianas, Task Force 58 was reducing the Japanese aircraft in the Marianas to gadfly impotence. The first TF 58 strike on the afternoon of 11 June was particularly effective since it gained control of the air in the Marianas, the first basic requisite for a successful amphibious operation. Japanese sources, after the war ended, reported there were over 500 aircraft based on Guam, Tinian, and Saipan about 1 June 1944. But by the time the TF 58 raids had started on 11 June, half of these planes had been ordered to island-hop to Halmahera off the west end of New Guinea to support the Japanese counter-offensive to recapture Biak Island 450 miles to the eastward. As many of the Japanese pilots were recent graduates of the flying schools, operational losses during this long inter-island hop were high. Japanese plane losses during the TF 58 sweeps ran past the 200 mark.55 When the TF 58 raids were over, there were comparatively few Japanese aircraft around to bother Task Force 51 on 15 June 1944, or on the days to follow. On 14 June, the old battleships of the Expeditionary Force took up the task of pinpoint bombardment of gun positions, and the Japanese batteries retaliated in kind, hitting the battleship California and the Braine (DD-630). time and no underwater obstacles were located off the chosen landing beaches. For quite obvious reasons, the Japanese chose the beaches between Agingan Point and Cape Obiam, providing the closest access (from good beaches) to Aslito Airfield, to be heavily mined with anti-boat and beach mines. Since the transports and their landing craft observed no gunfire from the beach, the only truth in this description is the hour of 0820 when the rear elements of the landing craft returned to their transports and were hoisted aboard. The Saipan assault required a simultaneous landing across a reef 250 to 700 yards wide of two divisions of Marines, landing eight Battalion Landing Teams abreast on eight landing beaches covering a front of 6,000 yards. 8,000 troops were due to go ashore in amtracs in the first hour. This was the largest landing of the Pacific campaign to date and necessitated the adequate coordination of the Landing Plans of the two Marine divisions, and an organization which would keep the very large number of assault craft, and the early logistic support craft, in reasonable step and balance. It was the first Central Pacific landing against a large heavily defended island and in marked contrast to the assaults against heavily defended coral strips. For the defense of Saipan, the enemy contemplated a series of strong beach defenses and a system of mobile defenses in depth behind the beach areas. . . . Landing Plan, Saipan, 15 June 1944.
for the large transports was eight to nine miles from the assigned beaches, and about three miles for the LSTs. The Line of Departure was 4,250 yards from the beach. Assault waves were landed in amtracs largely from LSTs which carried the first waves of Marines right on board. Transport Group Able had priority for the first two hours subsequent to How Hour on the use of the channel through the reef opposite Beach Blue One. UDT Seven blasted the outer reef for 200 yards opposite the Yellow beaches to open up another highly useful channel and on Dog Day plus two a channel to Red Beach Three was blasted out of the reef by UDT Five. The Landing Plans were complicated, as can be judged from the fact that the Transport Group Able Plan included four pages of diagrams just for forming up the early waves. Since "the correct part of the reef" was unmarked by buoys, this was a difficult chore and not perfectly performed. A combination of more active enemy mortar and machine gun fire from the area of Afetna Point and a current inside the reef lagoon, not detected by the UDTs, pushed the landing waves directed to land just north of Afetna Point, where Beach Green Two was located, further northward to Green One. The boat control officers had turned back at the reef and the Marine drivers of the amtracs were on their own while crossing the 600-yard-wide lagoon. The drivers on Red, Blue and Yellow beaches made their designated beaches. The drivers for Red and Green beaches to the north of Afetna Point all eased to the north, but only the ones for Beach Green Two failed to land on the correct beaches. Green One, Green Two, Blue One) had to be squeezed through one channel in the outer reef. A Traffic Control Officer with a bull horn undertook this difficult task. The time element in landing tanks through the channel was much too long, since only one LCM could negotiate the pass at a time. Initial landings were made successfully on schedule in the face of severe machine gun and mortar fire. This type of opposition proved to be a most critical feature of the day's operation as a deterrent element. Dive bombing by planes and close interdictive fire by supporting ships proved to be effective counter measures. . . .
and difficult to locate and during the first three days continued to inflict serious casualties upon our troops and beach parties. Way, way down the command chain, some of the operational problems loomed larger in the Dog Day reports. The LCI(G)s were stationed at the line of departure by 0750 and. . . . preceded the first assault waves into the beaches by 200 yards.
. . . Due to the protruding reef, the LCI(G)'s did not open fire with their 20mm guns or fire their rockets [on Red and Green beaches] as the range was too great for effective fire. . . . LCI(G)'s firing on Blue and Yellow beaches were able to get close enough to the beaches to effectively fire their 20mm guns and rockets. Landing craft and transports busy at Saipan. The LSTs had their problems also. The Japanese coast defense guns and artillery worried the landing craft late on Dog Day and the conscience of at least one of the skippers who retreated from them. Representative LST reports follow. The congestion of boats at the reef continued because of the limited beach usable at high tide and the fact that boats could not reach the beach at low tide. Early construction of a causeway pier at Beach Blue One facilitated logistic support, and LSTs were beached successfully on the reef opposite Yellow One on 17 June. The 27th Division troops were put ashore on the 16th, 17th, and 19th, the last Regimental Combat Team wading ashore from LSTs beached on the reef opposite Yellow Three. There were problems other than the heavy surf which held up logistic support from time to time during the first few days. These were the Japanese aircraft flown down from Iwo Jima and the Empire. The amphibians had gotten through the Kwajalein and Eniwetok assaults without a single Japanese airplane to worry them. This was not the case in the Marianas. Long before the battle on Saipan had been won, the Japanese First Mobile Fleet, under Vice Admiral Jisaburo Ozawa, took a fling at our amphibious forces, but found that Admiral Spruance and a reenforced Task Force 58 stood in the way. Separately, the Fast Carrier Task Force 58 comprised seven carriers and eight cruiser-hulled carriers, guarded by seven fast battleships, three heavy cruisers, ten light cruisers and 52 destroyers.89 Ships pulled out from the Joint Expeditionary Force and added to TF 58 included four heavy cruisers, three light anti-aircraft cruisers and 18 destroyers. Additionally, the Fleet Flagship Indianapolis with its two protecting destroyers moved from TF 51 to TF 58. Also, the eight older battleships, the three remaining cruisers and a good share of the remaining destroyers of the Joint Expeditionary Force were told off to cover the Transport Area during darkness from a position about 25 miles to its westward, especially to guard against the possibility that a fast detachment of the Japanese First Mobile Fleet might do an end run around TF 58 and seek to attack the cargo ships and disrupt the logistic support of the troops on Saipan. The 16th and 17th of June 1944, were days when the plans of the Joint Expeditionary Force were subject to many changes, as the Japanese First Mobile Fleet charged into the Philippine Sea from Tawi Tawi. The Battle of the Philippine Sea has been well and brilliantly told by a number of authors. There has been strong support from the Marines, from those who were in the amphibious forces, and from Fleet Admiral King in regard to the manner in which the battle was fought by Admiral Spruance. Before leaving Pearl Harbor, lengthy discussions were held concerning the prospect of Fleet action. Tentative decisions were made as to what action we should take if Fleet action should eventuate. The ideas of major commands were in complete accord that whatever happened, Task Force 58 would adequately cover the Expeditionary Force during its landing of troops. On June 16th, it became certain that the Japanese Fleet would attack. We believed then, and know now, that Admiral Toyoda's objective was air attack on the transports, using the airfields on Guam and Tinian for refueling and rearming. a. Reenforce TF 58 with 7 cruisers and 18 destroyers from the Expeditionary Force, and concentrated at noon June 18th, 350 miles to west to (1) cover the Saipan landings and (2) attack the Japanese Fleet. b. Continue transport unloading until dark June 17th, [then] leave behind the transports and LSTs needed immediately, plus screen and small craft, and secretly move the bulk of transports and LSTs out of sight to the eastward of Saipan. From there, transports and LSTs would be returned for unloading as called for. c. Continue full gunfire support of troops, but during darkness form up remaining battleships, cruisers and DDs 25 miles to the west in covering position. d. With three CVE divisions, provide [combat air patrol] CAP for ships near Saipan, and provide air for troops support as available. By dark June 18th, the enemy Fleet was thought to be still well to the westward. Admiral Spruance was strongly urged by some officers to make a fast run west and surprise the enemy at dawn. Instead he retired, as previously planned, toward Guam. In fact, the end run had already been made [by the Japanese]. At 0720 next morning CAP planes of the nearby Task Force 58 caught Japanese planes taking off from the Guam airfield after re-fueling. Then the Turkey Shoot began. By nightfall, Admiral Toyoda had had enough and started home. For a few days, our forces at Saipan had some minor air attacks by planes from Guam that had remained hidden, but damage was slight and there was not much interference with our landing operations. The point is mentioned to emphasize the importance of sticking to the objective. The Fifth Fleet objective then was the capture of Saipan, and only secondarily the defeat of the Japanese Fleet. To capture Saipan, we needed the transports afloat and not sunk. Suppose at 0800 on June 19th, Admiral Mitscher had been 600 miles away with all his planes in the air! but did not draw his carriers and battleships so far away that they could not protect the amphibious units. While Admiral Spruance was beating off the onrush of the Japanese Fleet, the situation ashore had continued to improve, and on 20 June, Lieutenant General H. M. Smith, Commander Northern Troops And Landing Force (CTG 56.1), assumed command ashore at about 1000. After the threat of the Japanese Fleet had been met and successfully dissipated by the Fifth Fleet under Admiral Spruance, the Commander Joint Expeditionary Force turned his thoughts again to the necessity of conserving the troops previously allotted for the Guam assault for that purpose. The Commander Joint Expeditionary Troops, being faced with a rugged and skillful defense by larger than anticipated Japanese forces on Saipan, and an extinction chore that was going slowly, cast envious eyes on the troops allocated for the Guam assault. Despite this unwillingness of CTF 51, the Guam attack was postponed until after the 77th Division arrived there. In fact, the date for launching the Guam assault was set exactly by the "when" the 77th would be available at Guam. ensure the complete control of Saipan rather than to have a foothold on both Saipan and Guam without complete control of either one. The troops of the Southern Attack Force were looked upon as a possible further reserve to bolster the hard fighting troops on Saipan. So the Southern Attack Force cruised around and around to the eastward of Saipan, waiting for favorable developments, before undertaking its assault on Guam. On 17 June it was decided by CINCPOA to prepare one Regimental Combat Team in Hawaii for possible early employment in the Marianas by immediate movement to Saipan. On the 21st, the decision was taken to bring all the 77th Infantry Division forward from the Hawaiian Islands as soon as practicable. 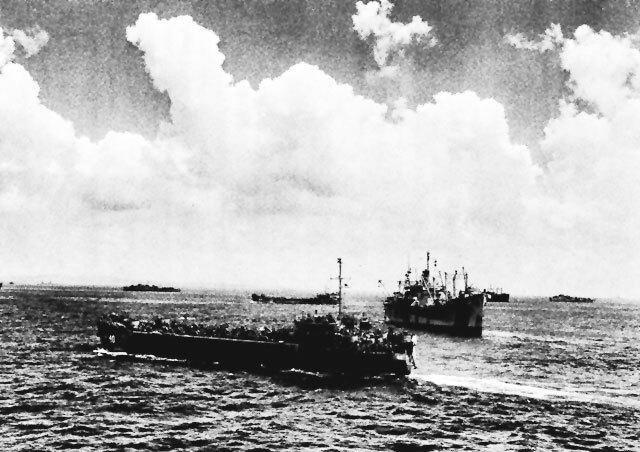 By dark 22 June, the last of enough transports to lift two Regimental Combat Teams of the 77th Infantry Division were unloaded at Saipan and hurried back to Pearl. Lift for the initial RCT of the 77th was already gathering at Pearl Harbor. 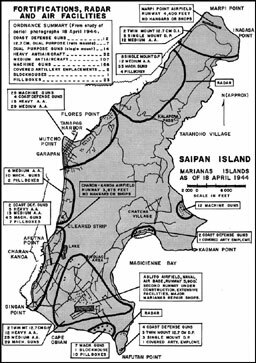 On 24 June, the 1st Marine Provisional Brigade was designated the Floating Reserve for the Saipan operation and the rest of the Southern Landing Force was ordered to return to Eniwetok to await the decision as to when it would assault Guam. Of course, we all feel disappointed over the fact that the Marianas Campaign is not going as rapidly as had been hoped for, particularly because of the ill effect on STALEMATE [Palau Island-Assault]. off on Tinian until the attack on Guam was well started. The latter started on 21 July and the Tinian assault three days later. The number of ships available in the Pacific for FORAGER was strongly influenced by the fact that the gargantuan amphibious landing in Normandy, France, occurred earlier in the same month as Saipan and had an overriding call on worldwide transport and cargo ship resources. Slow, but steady progress was made in capturing Saipan. The Marines raised the American Flag over the airstrip at the northern part of Saipan. By 1625, the entire island was secured and organized resistance ceased. This phase was conducted from 1040 to 1725 by seven new fast battleships temporarily detached from Task Force 58, and their anti-submarine screen of eleven destroyers. The bombardment was fired using plane spot and from ranges in excess of 10,000 yards. This latter precaution was necessary to keep the ships outside of mineable waters until these waters were swept. the statement that the big battleships at 10,000 to 16,000 yards remained out of range of the enemy shore batteries, is incorrect. The results of the gun bombardment by the fast battleships during Phase were incommensurate with the weight of metal dropped on Saipan during this bombardment. This was due primarily to inexperience of both the aircraft observers in locating Japanese camouflaged guns and of the gunnery personnel in conducting slow deliberate shore bombardment. 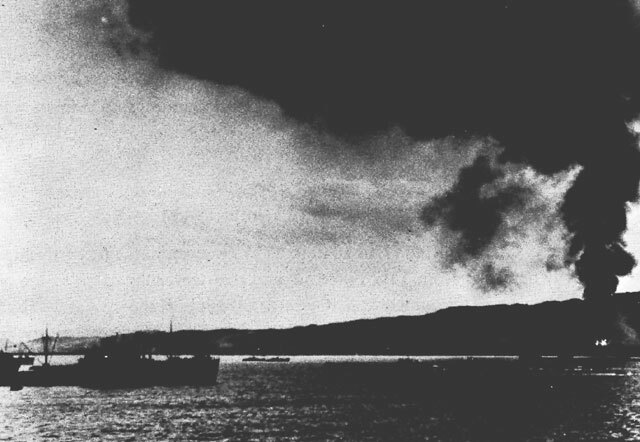 This firing was executed by ships of Task Group 52.17. It destroyed or neutralized a great many important targets and neutralized the beaches sufficiently that the assault troops were able to effect a landing. beaches, numerous Japanese mortars and artillery guns were not fired upon prior to the actual Saipan landing. The pinpointed naval gunfire bombardment essential to accomplish the results desired by the assault troops is a difficult chore, and involves manifold hazards and calls for first-rate skills. These aspects were touched upon several times in the reports on the Saipan operation. Close fire support ships were required to remain dead in the water in accurate positions prescribed, from HOW minus THIRTY until the passage of the last assault boat wave. The final support positions were established to place heavy ships at the stipulated minimum distance of 2000 yards from the nearest shoal or reef, and destroyers 1500 yards. The call fire on land is extremely quick and exact and until night attack units are some tens of meters from the enemy, they continue to receive naval gunfire. [Diarist] Practically all our anti-aircraft guns and machine gun positions were destroyed by bombing and shelling on the 13th, 14th and 15th. . . .
As previously noted, there were some balancing U.S. opinions to come to light a bit later. Since the length of the shore gun bombardment is always brought into question in connection with an assault landing, it is worth stating that long continued shore gun bombardment by heavy ships always draws enemy submarines to the area like bees to a honey comb. It was true at Guadalcanal, in the Gilberts, and in the Marshalls. So there was and is a naval reluctance to stay still in one spot in an area or even to stay around in an area too long and invite submarine attack. This is despite the real advantages to the assaulting troops of a long continued gun bombardment. A study of Japanese naval records by the Far East Command in the early 1950's indicated that the Japanese lost fourteen submarines in the Marianas area during June and July 1944. These were RO-36, 42, 44, 48, 111, 114, 117, the I-5, 10, 26, 54, 55, 184, 185.110 It was a minor miracle, despite our very excellent anti-submarine defense, that the ships of Task Force 51 and of Task Force 58 remained for long weeks in the vicinity of the Marianas without sustaining losses from these Japanese submarines. While the skill of our commanders was great and the valor of our troops unending, the battle was made longer by the low ratio of assaulting troops to enemy defenders. It would be unperceptive not to say also that a basic ingredient in the long and bloody struggle for Saipan was the confidence of the Japanese Commander and his troops in their ability to defeat an amphibious assault. 3. Admiral R.K. Turner, USN (Ret. ), Presentation delivered before the General Line School, Monterey, California, 5 Dec. 1949, sub: Major Aspect of the Marianas Campaign. 4. CCS 417, Report by JPS, 2 Dec. 1943, sub: Overall Plan for Defeat of Japan. 6. King's Record, pp. 532-535. 7. (a) CINCPOA to COMINCH, letter, 22 Feb. 1944; (b) CINCPOA to COMINCH, letter, Ser 00025 of 1 Mar. 1944. 8. Nimitz to King, memorandum, 8 Mar. 1944, sub: Sequence and timing of operations central Pacific Campaigns. 9. MacArthur to Marshall C1217, CM-IN-1443, 2 Feb. 1944. Modern Military Records, National Archives. 10. King to Nimitz, letter, Ser 00409, 8 Feb. 1944. 11. JCS to COMSOWESPAC and CINCPOA, 022941 2 Mar. 1944. 12. JCS to COMSOWESPAC and CINCPOA, 122319 12 Mar. 1944. 13. (a) CINCPAC-CINCPOA Op Plan 3-44; 9b) COMFIFTHFLT Op Plan CEN 10-44. 14. Turner, Presentation delivered before the General Line School, 5 Dec. 1949. 15. (a) COMINCH letter, Ser 0400 of 1 Feb. 1944, subj: Assignment of Vessels, U.S. Fleet; (b) CINCPAC PACFLT Confidential letter 6 CL-44, Ser 0956 of 14 Mar. 1944. 16. COMPHIBSPAC, letter, Ser 0226 of 2 Apr. 1944. 17. COMFIFTHPHIBFOR Roster of Officers, 1 May 1944. No roster is available in the files for 1 June 1944 or 1 July 1944. 18. Rear Admiral Draper L. Kauffman, USN, to GCD, letter, 6 Dec. 1965 and interview, 9 Dec. 1965. Hereafter Kauffman. 19. COMFIFTHPHIBFOR, letter, C5A/A16-3/Ser 00425 of 12 Apr. 1944, subj: Comments on FLINTLOCK. 20. CGFIFTHPHIBCORPS FLINTLOCK Report, 6 Mar. 1944. 22. JICPOA Bulletin No. 7-44, Marianas, 25 Jan. 1944; No. 34-44, Saipan, Tinian, Rota, 10 Mar. 1944; No. 73-44, Saipan, Tinian, Rota, 10 May 1944. 23. (a) JICPOA Bulletin Nos. 7-44, 25 Jan. 1944; No. 39-44, 26 Feb. 1944; No. 73-44, 10 May 1944; (b) COMFIFTHFLT Op Plan CEN 10-44, Appendix I. 24. (a) USSBS Interrogation No. 139, p. 143; (b) JICPOA Bulletins, No. 34-44, No. 66-44, No. 23-44; (c) Masanorito Ito, The End of the Imperial Japanese Navy, p. 77. 25. CINCPAC-CINCPOA Translation No. 9498, Central Pacific Area Force Secret Order No. 2, dated 21 March 1944. 26. COMFIFTHPHIBFOR, letter, Ser 00348 of 18 Mar. 1944. 27. USSBS Interrogation No. 225, p. 212. 28. CINCPAC-CINCPOA Monthly Operations in the Pacific Ocean Areas, June 1944, Appendix 9, p. 5. 29. Ibid., Annex A, pp. 8-9. 30. CINCPAC-CINCPOA Translation No. 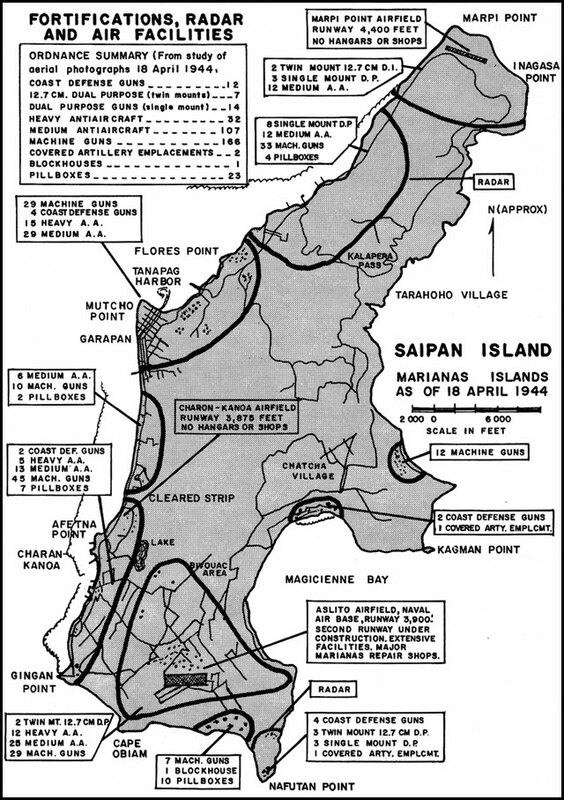 8946, Defense Plan for Saipan Island, 6 Sep. 1944. 31. USSBS Interrogations No. 32 and No. 47. 32. (a) CINCPOA Op Plan 3-44, 23 Apr. 1944; (b) COMFIFTHFLT Op Plan CEN 10-44, 12 May 1944; (c) COMFIFTHPHIBFOR (CTF 51) Op Plan A10-44, 6 May 1944; (d) CTF 52 Op Plan A11-44, 21 May 1944. 33. COMFIFTHPHIBFOR (CTF 51) Op Plan A10-44, Annex A, para 5. 35. RFT to TSW, letter, 30 Jul. 1944. 36. CTG 52.2, Report of Saipan Operation, 23 Aug. 1944, p. 18. 37. (a) CINCPAC Op Plan CEN 3-44 (FORAGER); (b) COMFIFTHFLT Op Plan CEN 1-44 (FLINTLOCK); (c) COMFIFTHFLT Op PLan CEN 10-44 (FORAGER); (d) CTF 51 FLINTLOCK Report, 25 Feb. 1944; FORAGER Report, 25 Aug. 1944. 38. (a) CTF 52 Training Order A12-44, 8 May 1944; (b) CTF 52 Training Movement Order A13-44, 7 May 1944; (c) CTG 52.2 Action Report, 23 Aug. 1944; (d) CTF 51 FORAGER Report, 25 Aug. 1944; (e) Interview with Admiral Hill, 1 Feb. 1967. Hereafter Hill. 39. (a) Hill; (b) COMLSTFLOT 13 Action Report, 11 Jul. 1944, p. 3. 40. Hogaboom interview, 15 May 1967. 41. Record of Proceedings of a Court of Inquiry to inquire into all the circumstances connected with the explosion in the LST-353 and the subsequent explosion in other ships in West Loch on May 21, 1944, Ser 001466 of 22 May 1944. Rear Admiral John P. Shafroth, Jr., USN, President of the Court. 42. Carter, Beans, Bullets and Black Oil, pp. 110, 112. 43. (a) COMPHIBFORPAC, letter, Ser 00019 of 26 Apr. 1944; (b) COMPHIBFORPAC War Diary, 2 Jun. 1944; (c) ALPAC-79 of 1 Jun. 1944. 44. COMLSTFLOT 13, Action Report, 11 Jul. 1944, p. 1. 45. COMLSTGRP 39, Action Report, 3 Aug. 1944, p. 1. 46. COMLSTFLOT 13, Action Report, p. 2. 47. COMFIFTHPHIBFOR (CTF 51) Op Plan A10-44, 6 May 1944, Intelligence Annex. 48. (a) Marine Corps Historical Monographs, Hoffman, Saipan: The Beginning of the End, and The Seizure of Tinian, and Lodge The Recapture of Guam; (b) Philip A. Crowl, Campaign in the Marianas, Vol. IX of subseries The War in the Pacific in UNITED STATES ARMY IN WORLD WAR II (Washington: Office of the Chief of Military History, Department of the Army, 1959), pp. 65, 279, 329, Appendix C.
49. ACS to CTF 56.G-2s Period Reports, No. 12 (26 Jun. 1944), No. 21 (5 Jul. 1944) and No. 23 (7 Jul. 1944). 50. (a) COMGEN Fleet Marine Force, Report of COMGEN Expeditionary Troops (TF 56), Marianas, 4 Oct. 1944, Vol. 3, Encl. (D), p. 2. Hereafter CTF 56 FORAGER Report; (b) CINCPAC-CINCPOA, Monthly Operations in the Pacific Ocean Areas, June 1944, Annex A, para 47. 51. COMFIFTHPHIBFOR War Diary, 10 Jul. 1944. 52. Ibid., 2 and 5 Aug. 1944. 53. (a) CINCPAC-CINCPOA Monthly Operations Report, June 1944, Annex A, p. 12; (b) CTF 51 FORAGER Report, Annex 3 to Encl. (A), p. 2; (c) CTF 56 FORAGER Report, Encl. (D), p. 41. 54. COMINCH Chart Room, FORAGER Subject File, Running Estimates. 56. COMFIFTHPHIBFOR War Diary, 14 Jun. 1944. 57. (a) Fane and Moore, Naked Warriors, pp. 86-88; (b) Plans Division, Pacific Section Staff COMINCH to COMINCH, memorandum, 21 Jun. 1944. 58. LST-272 War Diary, 14 Jun. 1944. 59. COMFIFTHPHIBFOR War Diary, 15 Jun. 1944. 60. CTU 54.5.3 (COMTRANSDIV 30) Action Report, 10 Jul. 1944, p. 8. 61. CTF 56 FORAGER Report, Vol. 3, 2 Oct. 1944, Encl. (D), p. 60. 62. CTG 52.2 Action Report, para 10, p. 19. 63. CTF 52 Attack Order A11-44, Encl. (A) to Appendix 1 to Annex J, p. 13a. 64. CTG 52.2 Action Report, 23 Aug. 1944, pp. 20, 878. 65. CTG 52.4 Action Report, 30 Jun. 1944, p. 3. 66. COMFIFTHPHIBFOR War Diary, 15 Jun. 1944. 67. CTG 52.2 Action Report, pp. 20, 21. 68. LCI(G)FLOT Three War Diary, 15 Jun. 1944. 69. LCI(G)-455 Operational Remarks, 15 Jun. 1944. 70. LCI(G)-726 War Diary, 15 Jun. 1944. 71. LST-226 War Diary, 15 Jun. 1944. 72. LST-242 War Diary, 15 Jun. 1944. 73. LST-271 War Diary, 15 Jun. 1944. 74. LST-267 War Diary, 15 Jun. 1944. 75. LSTGRP 14 War Diary, 15 Jun. 1944. 76. LST-224 War Diary, 15 Jun. 1944. 77. LST-278 War Diary, 15 Jun. 1944. 78. Ibid., 15 Jun. 1944. 79. CTG 52.2 Action Report, p. 74. 80. TRANSDIV 28 Control Officer, Report of Control Operation on Dog Day, 11 Jul. 1944, p. 3. 81. CTG 52.2 Action Report, p. 74. 82. CINCPAC-CINCPOA Monthly Operations Report, June 1944, Appendix 8. 83. LST-272 War Diary, 17 Jun. 1944. 84. COMLSTFLOT 13 Action Report, 11 Jul. 1944, p. 7. 85. COMLSTGRP 39, Action Report, 3 Aug. 1944. 86. CTG 52.2 Action Report, p. 82. 87. COMFIFTHPHIBFOR War Diary, 27 Jun. 1944. 88. Ibid., 2 Jul. 1944. 89. CINCPAC-CINCPOA Monthly Operations Report, June 1944, Annex A. 90. COMFIFTHPHIBFOR War Diary, 16 Jun. 1944. 91. R.K. Turner, Presentation at the General Line School, 5 Dec. 1949. 92. King's Record, p. 563. 93. COMFIFTHPHIBFOR War Diary, 21 Jun. 1944. 94. RKT to TSW, letter, 30 Jul. 1944. See also COMGENCENPAC to CG 24th Corps, 180900 June 1944; COMFIFTHFLT to CINCPOA, 240622 Jun. 1944; CTF 51 to CINCPAC, 232020 Jun. 1944. 95. RKT to CWN, letter, 5 Jul. 1944. 96. RKT to TSW, letter, 30 Jul. 1944. 97. COMFIFTHPHIBFOR War Diary, 9 Jul. 1944. 98. CTF 51 092244 Jul. 1944. 99. COMFIFTHPHIBFOR War Diary, 10 Jul. 1944. 100. CTF 51 FORAGER Report, Annex 3 to Encl. (A), p. 2. 101. CTF 56 FORAGER Report, Vol. 7, Encl. (D), G-2 Report, pp. 10-011. 103. Ibid., Encl. (G-2), p. 11. 105. Smith, Coral and Brass, p. 162. 106. CTG 52.2, Action Report, pp. 86-87, 92. 108. CINCPAC-CINCPOA Monthly Operations Report, June 1944, Appendix 9, Translations of Japanese despatches, pp. 6, 9. 109. (a) Quoted in Carl W. Hoffman, Saipan: The Beginning of the End, Marine Corps Monograph (Washington: Historical Branch, Headquarters, U.S. Marine Corps, 1950), p. 248; (b) CINCPAC-CINCPOA Bulletin No. 116-45, Translation Interrogations No. 29, 21 May 1945, Intern No. B-1938. 110. The Japanese Monograph No. 116, The Imperial Japanese Navy in World War II, Military History Section, Special Staff, General Headquarters, Far East Command, February 1952, pp. 202, 204. 111. CTF 56 FORAGER Report, Vol. 4, Encl. (A), G-2 Periodic Report, p. 3. 112. Transport Squadron 12, Command History, 8 Nov. 1945, p. 16.